Endermologie is an exciting treatment that’s well-suited for spas, physical therapists, chiropractors, and other businesses. If your enterprise is offering this procedure or considering adding it, you can apply these marketing tips to promote the service. 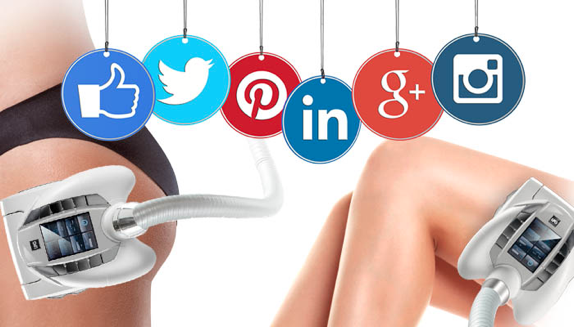 Reviews and testimonials are the most powerful marketing tools for beauty services like Endermologie. People will naturally want to talk about their positive experiences, but you should also incentivize customers to share honest reviews online. Referrals are one of the best ways you can grow your business. When loyal customers refer other people to your business, the new customers you generate will become just as loyal, giving you even more opportunities down the line. By offering incentives for customers to make referrals, you are creating happy customers through word of mouth and honest reviews. Companies like Airbnb, Dropbox, and even Facebook have all used referral programs and become very successful in the wake of their efforts. Once you have some happy customers, make it easy for them to return for additional treatments. Bundle treatments or offer discounts for your loyal clients. This motivates them to return, and it gives them a reason to try different services and share the results. Who doesn’t love a good selfie? Social media users certainly do, and since Endermologie helps people look their best, they’ll get online ASAP to share their results. Make sure your company has a presence on platforms relevant to your industry to help people caught up in the hype of a friend’s successful treatment find you easily. Of course, you should do more on social media than simply starting a page. Respond to all posts, whether someone is sharing a positive story, asking a question, or complaining. In addition to being active on social media, you can start a blog. This will help you stand out as a thought leader in an industry, and it increases the chances that a potential customer will find your website in search results. Encouraging a group to come in for treatments is a great way to attract multiple clients at once. Plus, you’re increasing your chances to generate organic marketing through personal recommendations and reviews. Endermologie is providing astounding results. Indeed, thousands of people are signing up for these treatments every day. If you’re ready to start offering Endermologie, reach out to Endo-Systems for products, training, and other services. Any enterprise can profit from word of mouth advertising, but it’s especially beneficial for businesses that offer endermologie and other beauty services. This is because customers who are happy with their results are a trustworthy source that friends, family members, and potential visitors will gladly rely on. Here’s how you can get quality referrals from current customers to bring in new customers. 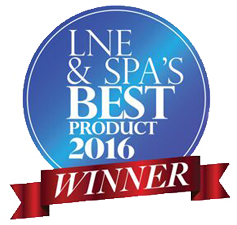 Do you want customers to share a positive experience with your endermologie treatments? Though they might mention their results casually to friends, you can incentivize customers to be more deliberate by offering discounts on return services or other deals or freebies to encourage them to leave a review online. Note that these recommendations must be sincere. Don’t just incentivize positive reviews. You need to encourage customers to be honest about their experiences and the results. People are adept at spotting phony recommendations and shallow advertisements, and promoting insincere reviews could drive customers away. Customers won’t share their experiences if it’s not easy for them to do so. You need to meet users on every platform where they might come across your business, from social media channels to Google search results and on sites like Yelp and Angie’s List. When you incentivize your customers to share, tell them where and how they can do so, such as retweeting one of your promotions on Twitter, sharing your page on Facebook, or leaving a review on Google. If a customer refers your business, thank them for doing so. Respond to all positive and negative reviews, and you’ll build a fantastic image online. Customer referrals are a great resource for any enterprise, but they’re especially important for businesses offering beauty services and results that people will want to brag about. If you want to start offering endermologie treatments, reach out to Endo-Systems today. Endermologie and CoolSculpting both reduce the appearance of cellulite without undergoing an invasive surgery. Learn about the differences between these techniques to better understand how endermologie® works and see whether starting an endermologie® business or adding these solutions to a current enterprise is viable for you. Treatment Description Endermologie® uses mechanical cellular stimulation to target dormant cells and cellulite dimples, firming the skin, reducing fat, and smoothing cellulite. 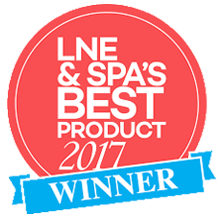 This service is delivered via an endermologie® machine, which has rollers and a suction system that a specialist uses to treat customers. The CoolSculpting treatment works by a process called Cryolipolysis®. The fat cells in the treated area are crystalized (frozen) to the point where they are damaged and die – a process called apoptosis, or programmed cell death. Over time, your body naturally processes the fat and eliminates the dead cells. Side Effects During: None (Besides Relaxation! )After: No Known Side Effects During: You may experience sensations of pulling, tugging, mild punching, intense cold, tingling, stinging, aching, and cramping.After: Bruising, redness, numbness, tenderness and in rare cases Paradoxical Adipose Hyperplasia or PAH has been reported (Enlarging of fat cells rather than shrinking and dying). Treatment Areas Endermologie can be used to treat the entire body, including the face. FDA-cleared for the treatment of visible fat bulges in the submental area, thigh, abdomen and flank, along with bra fat, back fat, underneath the buttocks, and upper arm. Cleared Claims& Therapeutic Claims Cellulite ReductionImproved Local Blood FlowReduce Circumferential Body Measurements in treated areasRelieves minor muscle aches and painRelieves muscle spasmsImprove local blood circulation during burn rehabilitation RxRelieves DOMS (Delayed Onset Muscle Soreness)Reduction of secondary lymphedema of the armImprovement of secondary lymphedemaImprovement of lymphatic circulation in the treated area Treatment of visible fat bulgesAffects appearance of lax tissueRelieves minor muscle aches and painRelieves muscle spasmsImprove local blood circulationMinimize pain and thermal injury during laser and dermatological treatmentsTemporary reduction in the appearance of cellulite. 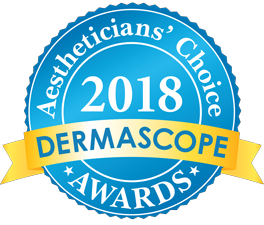 Endermologie and CoolSculpting offer impressive results, and the fact that these procedures are non-invasive makes them a wonderful service for spas, resorts, massage therapists, and skin care centers to offer. Learn more about endermologie® and see how you can integrate these solutions for your customers with help from Endo-Systems. 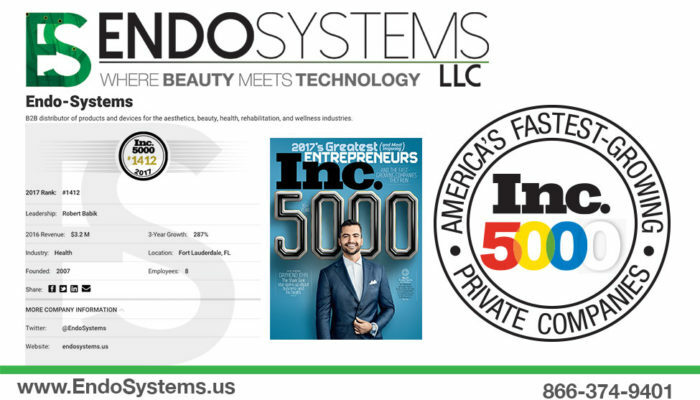 FORT LAUDERDALE, Fla. — Inc. magazine ranked Endo-Systems on its 36th annual Inc. 5000, the most prestigious ranking of the nation’s fastest-growing private companies. The list represents a unique look at the most successful companies within the American economy’s most dynamic segment— its independent small and midsized businesses. Endo-Systems is a leading B2B distributor of today’s most scientifically advanced products in the industries of aesthetics, beauty, health, rehabilitation, and wellness. Due to exceptional growth, Endo-Systems achieved a ranking of 1,412 and boasts a three-year growth rate of 287%. Learn more at https://www.inc.com/profile/endo-systems. According to Transparency Market Research, the global anti-aging industry will be worth nearly $200 billion by 2019. Boomers equate a large portion of this market in the U.S., as both investors and consumers. Younger generations are on board the beauty train, seeking new treatments and solutions. Who Doesn’t Want to Look Beautiful, Naturally? This growth is big business for spa, health spa, medspa and medical center owners. Today’s consumers are savvy, they have a mountain of information at their fingertips to research products and treatments. There is a growing demand for all-natural, non-invasive treatment options that have documented results, and stellar reviews.